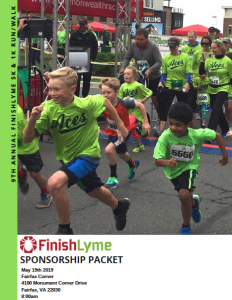 We invite your business to sponsor the FinishLyme 5K/1K Run/ Walk to benefit the National Capital Lyme Disease Association. For the last 8 years, this event has attracted a broad base of consumers. Each year we draw approximately 1,500 participants and 125 volunteers. Download the PDF below to find out how you can benefit from a sponsorship and complete forms on pages 7 and 8 or online to become a sponsor. You can register as a sponsor online. Just follow the link below and you will be able to provide all your information, upload your logo and pay online.